In the present study, the influence of atomic ratio of Zr to Ti on the microstructure and mechanical properties of Ni–Cu–Zr–Ti–Si–Sn alloys is investigated. The alloys were designed by fine replacement of Ti for Zr from Ni39Cu20Zr36−xTixSi2Sn3. The increase of Ti content enhances glass forming ability of the alloy by suppression of formation of (Ni, Cu)10(Zr, Ti)7 phase during solidification. With further increasing Ti content up to 24 at.%, the B2 phase is introduced in the amorphous matrix with a small amount of B19′ phase from alloy melt. 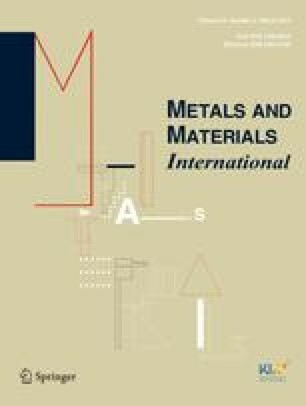 The bulk metallic glass composite containing B2 phase with a volume fraction of ~ 10 vol% exhibits higher fracture strength (~ 2.5 GPa) than that of monolithic bulk metallic glass (~ 2.3 GPa). This improvement is associated to the individual mechanical characteristics of the B2 phase and amorphous matrix. The B2 phase exhibits higher hardness and modulus than those of amorphous matrix as well as effective stress accommodation up to the higher stress level than the yield strength of amorphous matrix. The large stress accommodation capacity of the hard B2 phase plays an important factor to improve the mechanical properties of in situ Ni-based bulk metallic glass composites. Hyo Jin Park and Sung Hwan Hong have contributed equally to this work. This work was supported by the National Research Foundation (NRF) of Korea grant funded by the Korea government (Ministry of Science, ICT & Future Planning) (No. 2017R1C1B5017092), the Industrial Infrastructure Program for fundamental technologies (Project No. N0000846) and the Energy Efficiency & Resources Core Technology Program of the Korea Institute of Energy Technology Evaluation and Planning (KETEP) (No. 20142020103910) funded By Ministry of Trade, Industry and Energy (MOTIE, Korea).